Homemade Gravlax or Lox is one of my FAVORITE things to make when the salmon season gets underway here in Alaska. I use my favorite recipe year after year, it’s a good one made with vodka, lemons, and dill, and it’s ALWAYS fabulous. This year I got into foraging and decided to try something a little more “out there” for most of you (and let’s be honest me too! ), Spruce Tips Gravlax, or Lox as it’s commonly called. If you’re not interested in using wild foraged spruce tips, but you still want a solid Gravlax recipe, I can’t recommend my original recipe enough. 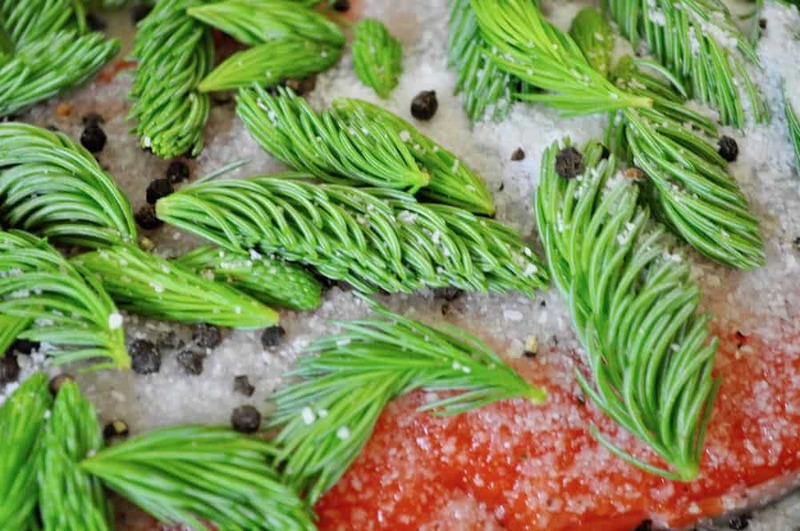 This recipe for Spruce Tips Gravlax, or my original, is the perfect gift for giving too. Plus you can never go wrong when you pull out a home-cured Salmon snack for your guests, be it smoked salmon, smoked salmon dip, or my lox recipe. 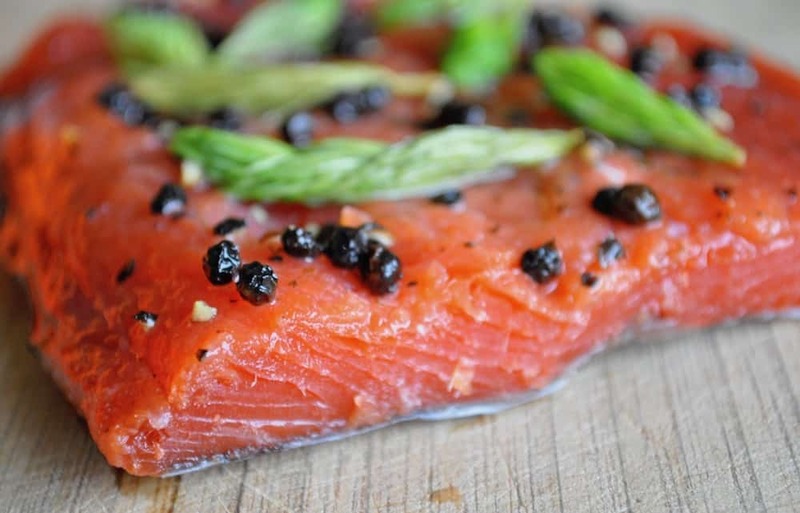 A quick note: this Spruce Tips Gravlax Recipe is a cold cured salmon that is not cooked and not cooked. 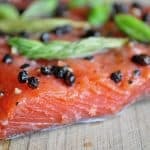 If you can’t eat cold cured salmon, then this isn’t the recipe for you. Smoked salmon is what you’re looking for. If you’re looking for a good lox recipe to serve with bagels and cream, then this recipe IS for you. Yep, you heard it heard the salmon are running! The season starts here in Alaska with the Copper River Red Run which is always fabulously out of our price range. And getting our own first of the season COpper Rive Red isn’t likely to happen for us. 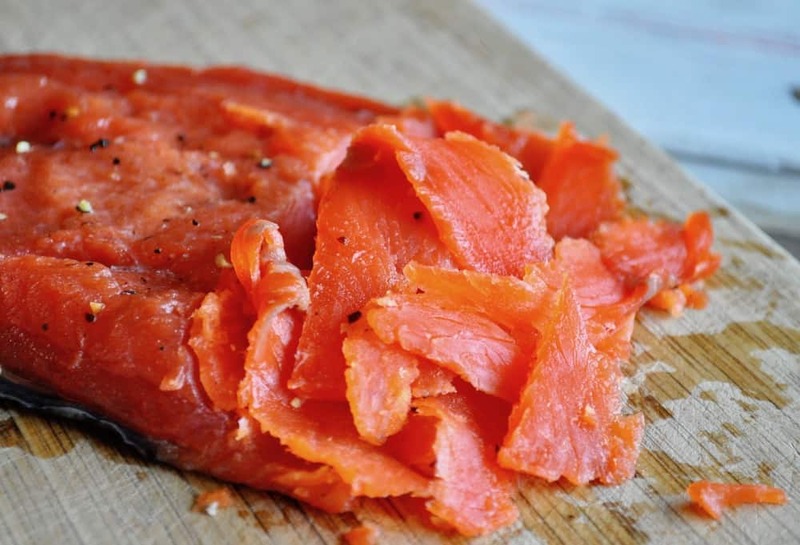 Luckily you DON’T need a Copper River Red to make the Spruce Tip Gravlax, ANY good clean red or sockeye salmon will do. I like reds, they’re plentiful, we dipnet the hell out of them in the summer and if we’re not able to get out fishing or we get skunked they are affordable to purchase. Yes, the spruce tips are still edible and plentiful. Even in my yard here in South Central. I think at higher elevations and farther north, the season is just getting started. I also found that on my property the north side of the trees still had small spruce tips that had yet to emerge, so there are spruce tips out there! Homemade Gravlax or Lox is one of my FAVORITE things to make when the salmon season gets underway here in Alaska. I use my favorite recipe year after year, it's a good one made with vodka, lemons, and dill, and it's ALWAYS fabulous. This is a foraged riff on that old fave! I am so jealous you are able to make this with fresh caught salmon. It looks fabulous!